Big, brash, fast: these traits define a supercar, but who was the first to put them all together? According to Jalopnik readers, these are history's first ball-busting, mind-bending, paradigm-shifting automobiles. What was history&apos;s first supercar? Why it's more than just a car: The most super of supercars is certainly the Bugatti Veyron. It's wildly fast, and it's not really good at anything but showing off and accelerating like a fighter jet. So let's just say that the more like a Veyron these classic cars are, the more they deserve supercar cred. The Lamborghini Miura got a lot right back in 1966. It had cutting-edge technology in its mid-engine layout and sideways-mounted, 350 horsepower V12, and it never went racing. That meant all the Miura did was go unbelievably fast and make you look extremely, extremely rich. That and it was unbelievably gorgeous. Perfect supercar. Why it's more than just a car: It's not hard to find the quotation that the term "supercar" was coined for the Miura. That's a load of crap. Not only had people been using the term for years, but real supercars had been around for longer, cars like the Gullwing Mercedes that debuted in 1954. The Gullwings get minus points on the supercar scale for being based on Mercedes' road racing 300SLR of the time. Supercars are about going fast and looking like a million bucks, not actually performing in a reliable, efficient manner. Still, these cars make up for their deficiency with mechanical direct fuel injection, cutting-edge automotive tech that Mercedes figured out during WWII. Not only did the car have over 200 horsepower from its 3-liter straight-six, it was as expensive as a nice house. Oh, and we shouldn't forget those doors. Why it's more than just a car: Before it was a plaything for Volkswagen's megalomaniacal business plans, Bugatti was the finest builder of sports caring cars in the world. In the 1920s, no one could touch the small firm near the French-German border. They built unbelievably fast cars and the fastest, wildest of all was the end-of-the-line Type 57SC. The S told you the car was lower than usual, and the C stood for the supercharger on the engine. The 3.3 liter, twin cam straight-eight put out over 200 horsepower, and matched with an eager, nervous chassis it was the greatest sports car of its day. What made them so unreal was not the power, the finesse, or the styling, but that they built exceedingly frail cars. They were so touchy you had to drain and warm the car's oil on the stove before putting it back into a cold car. Why it's more than just a car: Duesenberg was America's real sports car king, having made their place in the sports car hierarchy in the late Nineteen-teens and early Twenties from their home base in Auburn, Indiana. Their pinnacle in road cars was the 1936 SSJ, a high-powered speedster-bodied version of their preeminently powerful, unbelievably luxurious Model J. Only two cars came out of the factory; one went to Gary Cooper and the other went to Clark Gable. The SSJ wasn't exactly the McLaren F1 of its day – it was too big and heavy for that, but it was very much like a Veyron in its presence and its leather-lined interpretation of the supercar ideal. Why it's more than just a car: Auburn Speedsters were not the fastest cars of their day. They were not the best to drive, and they didn't have the greatest pedigree. They were big, bold American interpretations of darty little European sports cars, better for big time posing and stoplight drags down Fifth Avenue. They are always remembered by their pointed boat tail, but it's worthwhile to see them from the front, where they flashed a gaudy, chromed-out grill like the showoffs they were. Suggested By: Behold, for I am I Can be Stig? Why it's more than just a car: The defining feature of the Mercedes-Benz SSK is its supercharger. Mercedes had already designed an "S" model, and followed that up with an "SS' model, but it was the Porsche-designed SSK (the K stood for short) that set the world's roads on notice with a clutch-operated supercharger that, if engaged for too long, would readily blow up your engine. If having a luxury road racer that can blow up its own engine with the kind of power it produces isnt' a supercar, I don't know what is. Why it's more than just a car: This is a 21.7 liter, 320 horsepower one-off land speed record holder known simply as "Mephistopheles." Power from the six-cylinder Fiat airship engine went to the rear wheels not with a driveshaft, but with a goddamn chain. How they ever took this thing to 146.01 miles an hour in 1924, becoming the fastest thing on planet Earth is beyond me. 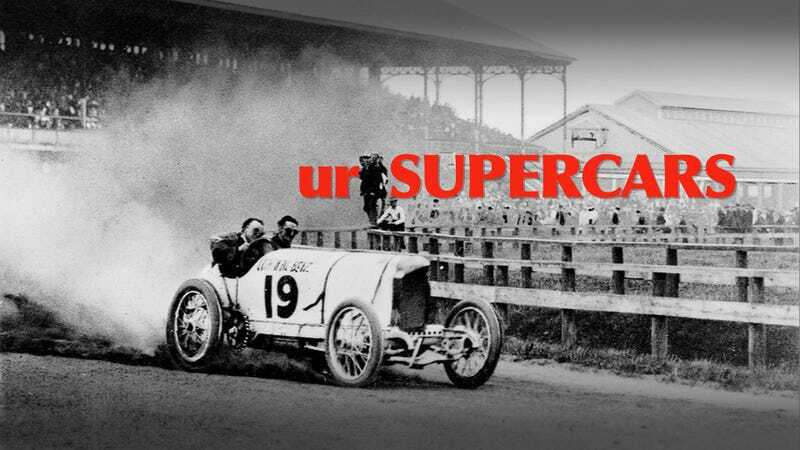 Why it's more than just a car: The Bearcat, aside from being the best-named car of all time, was one of the great road-going racers of the Nineteen-teens. It debuted in 1912, but kept to its basic formula through 1917. It raced at the Indy 500 and you could buy one just to take from mansion to mansion with some handsome bodywork and a secure knowledge you were the fastest thing on the road, unless of course a Mercer showed up. Why it's more than just a car: The Mercer Raceabout was basically an Indy 500 racer with fenders. Its 5.0-liter four-cylinder engine put out no more than 56 horsepower at 1900rpm, but that was enough to allow the car to hit 70 miles an hour whenever you so cared. Compared to the Model T Fords putting around at the time with a top speed of 45 (not that you had the cajones to ever get near that number), the Mercer was a rocket ship. Why it's more than just a car: The Blitzen "Lightning" Benz of Benz & Cie. (who later merged with Daimler Motor Company to form Daimler-Benz) held the land speed record of 142 mph from 1909 to 1919. It was twice as fast as a plane back then. The 200hp, 21.5-liter four cylinder-powered car was built for taking the land speed record, which might make it seem more like a racing car than a real supercar in the modern mold. Well, don't blame the competition record on the car, that's just what people did with cars like this back in the early 20th Century. If anything, it's a shame people aren't taking Veyrons to Le Mans.